The 2015 Life March in Baton Rouge, Louisiana, again rated #1 Most Pro Life State in the nation, was held this year at the Louisiana University Campus, LSU. Three thousand marchers first gathered at the outdoor Greek Theater where Governor Bobby Jindal gave a riveting speech. Then they walked through campus toward the PMAC Assembly Center where an all-day prayer rally was being held, hosted by Governor Jindal, and sponsored by The American Family Association. 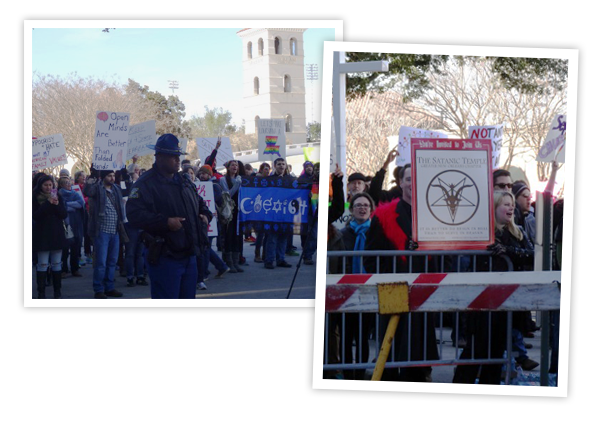 Some 300 hundred protesters, calling their protest “Organizing Against Hate Groups”, and including pro-abortionists, LGBT groups and Temple of Satan, gathered in front of the LSU PMAC Assembly Center where a day-long prayer rally was being held. The rally was hosted by Governor Bobby Jindal and sponsored by American Family Association. Many Pro-Life marchers marched passed the protesters into the Assembly Center at the end of the march. ANF members with their banners that said: Pray for America: Act of Reparation for sins against nature, abortion and socialism. May God have mercy on us! chose to say a Rosary across from the protesters outside the Assembly Center. The protesters were quite angry at Governor Bobby Jindal, making their stance clear in slogans and signs. Nevertheless, police officers did a great job maintaining perfect order.